Cannot be used at the Driftwood, Round Rock or airport locations. For use online only. 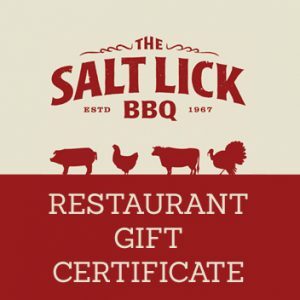 Restaurant Gift Certificates are available here. 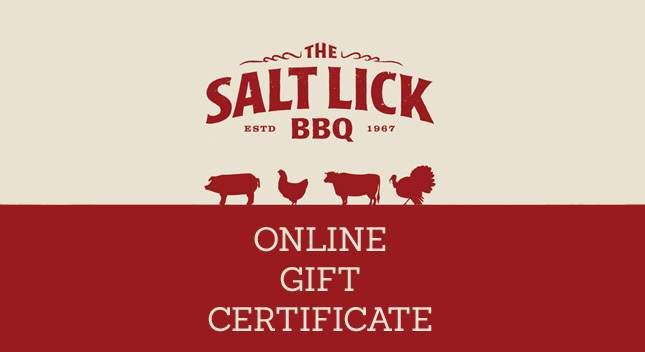 Gift certificate to be used on The Salt Lick BBQ website only. IF YOU ARE GIVING THIS AS A GIFT, be sure to fill out the ‘Store Credit Receiver Details’ during checkout process (below your billing information). Here, you have the option to gift the store credit to someone else.